Salvage operations take place when shipping accidents happen. South Africa is fortunate to have highly skilled and professional salvage companies to stop shipping accidents turning into marine disasters. As part of our day to day activities we are often called upon to assist during these operations. We are glad to contribute our expertise when needed. 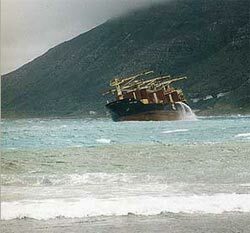 On the 19th August 2003 at 6.40am the Sealand Express, a fully laden container ship, was driven by heavy seas into Sunset Beach in Table Bay, Cape Town. Salvage efforts to remove 4700 tons of fuel and hazardous materials last over 15 days. On the 5th of September 2001, during the worst storm to hit the Cape in 50 years, a bulk carrier suffering from engine failure was swept by stormy seas and howling gale force winds towards the beautiful beach of Scarborough, approximately 50 kilometres from Cape Town. Ikan Tanda, a 17 800 DWT, general dry cargo vessel registered in Singapore, was carrying a cargo of 15,500 tonnes of Potassium Nitrate, Potassium Sulphate, Potassium Chloride and Boronat in five holds from Chile to Singapore. Grounded, she eventually settled on a sandbank about 300 metres from the beach. What ensued was a dramatic salvage effort - exacerbated by gale force winds and a storm that had rendered many of Cape Town's suburbs disaster areas. Salvage efforts to remove both packed and liquid cargo were to last over 10 days. METS's CraneTrucks were used on numerous occasions to transport, load and offload salvage equipment at the Scarborough incident site. Our crew was airlifted onboard by helicopter to perform faultfinding and modifications in order to get the ship's cranes operational. METS was also involved in assisting the salvage crew with the connection and operation of various submersible pumps and portable gensets. After many days spent removing both bulk and liquid cargo, re-floatation efforts finally succeeded in getting the vessel mobile. The 2-week ordeal came to a sad end as the owners were compelled to scuttle the ship 200kms of the Cape coast. When both the Sagittarius, a cargo vessel transporting grain to Angola, and Nino, a fuel tanker, ran aground within days of each off the notorious Wild Coast, METS was asked to assist with both salvage operations. Crews from both ships were rescued by helicopter as frantic efforts began to contain petroleum leaks from the Nino's hold and the fuel tanks of the Sagittarius. METS crew was also airlifted onboard the Sagittarius to assist the salvage crew with the removal of fuel oil from ship to shore, as well as emergency lighting procedures. We assisted with the pumping of fuel from 1-ton tanks into larger tanks on shore-side as well as the use of an oil burner to burn off excess fuel. These1-ton tanks were airlifted in relays from ship to shore over a period of three days. The tanker Nino, which ran aground on a sandbar, was stuck half a kilometre offshore from the pristine Dwesa nature reserve south of Coffee Bay. It was carrying thousands of tons of petrol and diesel fuel. METS assisted the salvage crew with the assembly of flotation pipes, which were transported by sea to the Nino. Fuel was transferred into the tug and transported to East London, where we assisted the crew in transferring the oil from the tug to a barge in East London harbour. METS spent a total of 10 days on the casualty site. 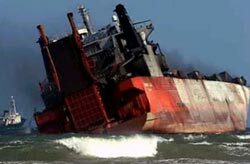 The Jolly Rubino, an Italian 31,362 GT cargo RoRo vessel ran aground after a fire off the KwaZulu-Natal coast in September 2002 causing huge environmental concerns. 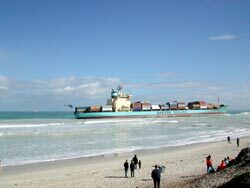 The 31 000 ton container ship, with 1100 tons of fuel on board, as well as a large amount of hazardous chemicals, was driven by gale force south-westerly winds onto the beach. As the vessel continued to be pounded by volatile surf a fire continued to smoulder as cotton and plastic cargo burned below deck. A large crack had opened on the port side, trickling some 300 tons of oil from the ruptured number three tank. METS was asked to assist with the transportation of salvage equipment by CraneTruck from Cape Town to Richards Bay. Numerous trips were subsequently undertaken between St Lucia, Richards Bay and Durban, transporting salvage equipment and supplies. Thirty temporary lights made up for salvage operation. METS was on site for 10 days.